Very cold weather increased the demand for natural gas used for home heating and for gas-fired electric generators in the Northeast, causing a spike in prices earlier this month. Prices spiked because of the increased demand for natural gas and because constrained gas pipelines could not handle the additional volume. Natural gas for all uses is increasing in the Northeast, and is expected to continue, as the EPA implements policies drastically reducing the use of coal fired generation and nuclear plants are being retired. The Northeastern states has been reducing their fuel diversity, but it is unclear whether decision makers are giving adequate consideration to the demands on natural gas–their replacement fuel of choice. New and expanded pipelines, more local production of natural gas and other means of obtaining abundant and reliable supplies are needed in the Northeast lest even more dramatic price shocks should occur due to inadequate supplies. The natural gas drilling boom in shale fields due to the use of hydraulic fracturing coupled with horizontal drilling led to a plunge in gas prices that caused an increase in natural gas-fired generation and a shift from heating oil to natural gas in the Northeast. Natural gas generated less than 30 percent of New England’s electricity in 2001, but provides more than 50 percent today. Natural gas pipelines are able to handle the increased demand during the summer months, but the pipelines become constrained in the winter due to the added demand for heating, particularly in very cold weather. During the cold spell, some power providers imported more gas from Canada through pipelines that have become underused in recent years due to the domestic shale gas renaissance and from abroad as liquefied natural gas. Twenty interstate pipeline systems operate between Virginia and Maine, delivering gas from the Marcellus field, the Gulf of Mexico, and Canada. 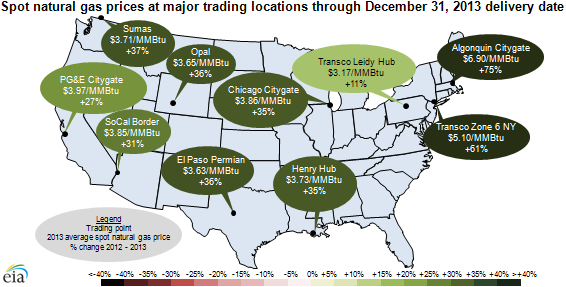 Due to several regional natural gas price spikes occurring last winter, several gas pipeline expansion projects were completed over the past year connecting the Marcellus field to New York and New Jersey. More expansions are scheduled through 2015. Additional pipeline service to New England, an expansion of Spectra Energy’s Algonquin Incremental Market pipeline project bringing new Marcellus gas production through Connecticut, Massachusetts and Rhode Island, is anticipated for 2016. New England expects more than 1,369 megawatts of generating capacity to be retired between 2013 and 2016. Dominion Energy Resources is planning to retire the nearly 750-megawatt Salem Harbor coal- and petroleum-fired power plant in Massachusetts in 2014 due to the costs of compliance with new environmental regulations and declining profits for coal-fired units in Independent System Operator (ISO) of New England. [vi] To keep operating its coal-fired power plants, the company would need to spend millions of dollars on environmental equipment to comply with EPA regulations. Clearly, the amount of electricity from natural gas fired plants in New England will be increasing beyond its current 52 percent share due to these premature retirements of nuclear and coal-fired power plants caused primarily by onerous federal regulations. This turn of events is also dangerously narrowing energy diversity in the region. Energy diversity is needed due to pipeline constraints for moving natural gas and future expected increases in natural gas prices. If government leaders in the Northeast and throughout the country are looking to natural gas as the answer to their future energy needs, it is important that the infrastructure be available to transport needed energy from sources of supply to demand areas, particularly when demand increases quickly due to extremely cold weather when consumers need the energy for warmth. If the infrastructure is sufficient, large price spikes will be less likely to occur. In the case of the Northeast this month, the availability of Canadian gas and liquefied natural gas helped to alleviate even larger price spikes. However, a separate cause for concern is the lessening in diversity in Northeast energy markets with natural gas used for electric generation increasing from a 30 percent share to over 50 percent in New England, coal-fired generators being prematurely retired due to onerous regulations from the EPA, and natural gas displacing heating oil because of its favorable economics. This trend will put an even larger strain on inadequate pipeline infrastructure, and likely lead to price spikes and other disruptions if care is not taken to ensure adequate production and flow of energy. The recent cold spell should serve as a wakeup call to those whose policies have consequences for consumers, businesses and jobs. Did Wind Really Save Texas from Rolling Outages?